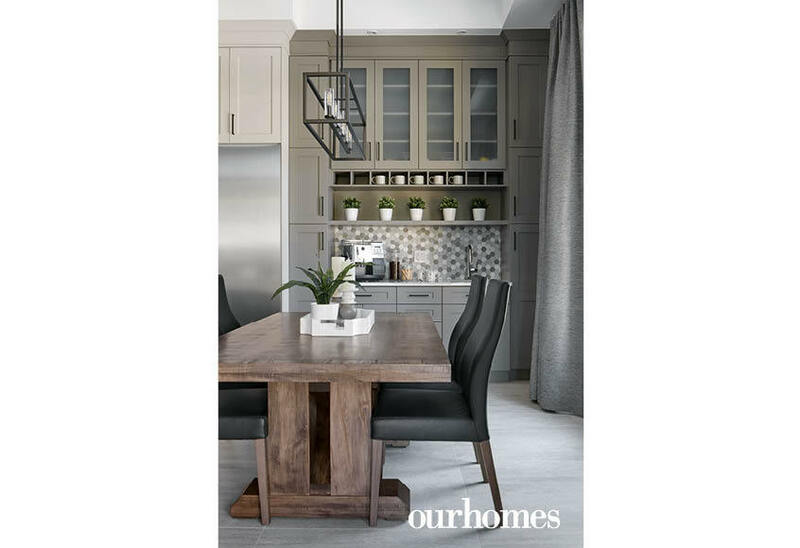 A version of this article originally appeared in the Spring 2019 issue of OUR HOMES Hamilton and Area, p.44. 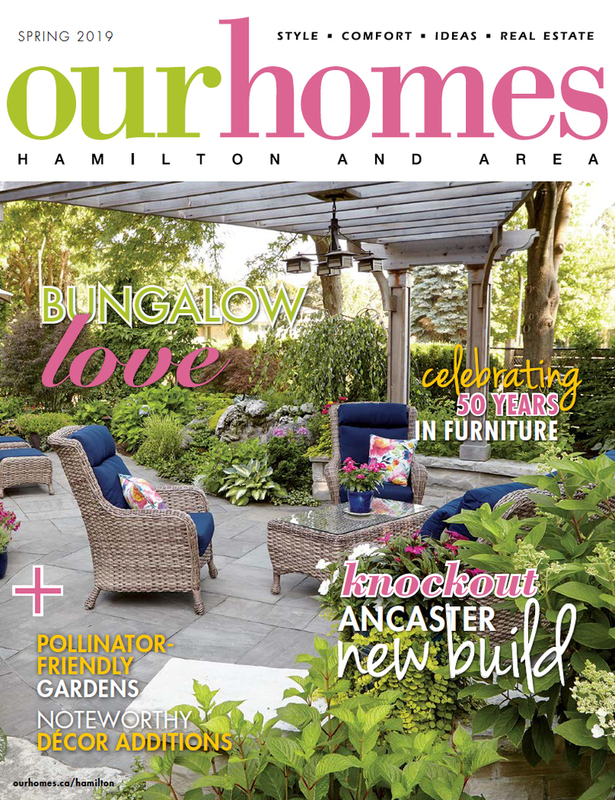 Find local businesses in our Hamilton directory. Frank and Tina enlisted the help of Jill Fraser, owner of House of Fraser Decor, and Christina Wickenden, owner of The Green Door Decor. 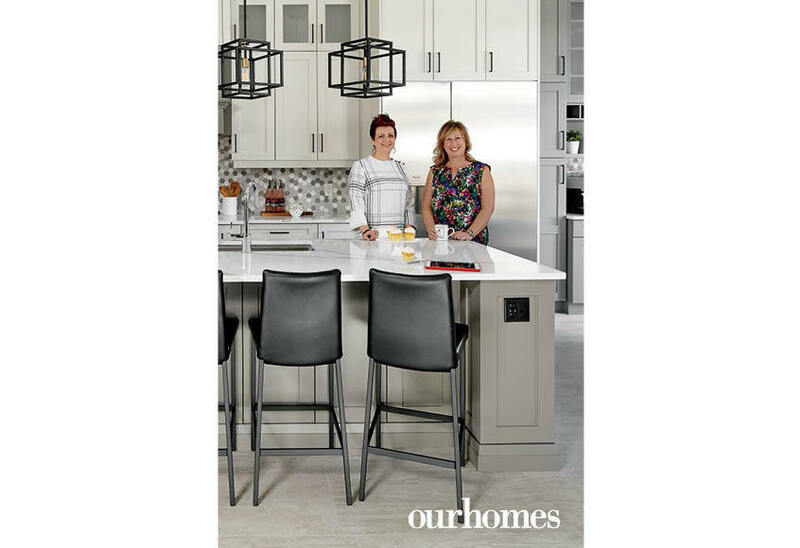 As a team, Jill and Christina had worked with Frank for years, and have known Tina personally for almost as long, so they had plenty of insight into what the family would want and need in a house designed to grow and change with them. 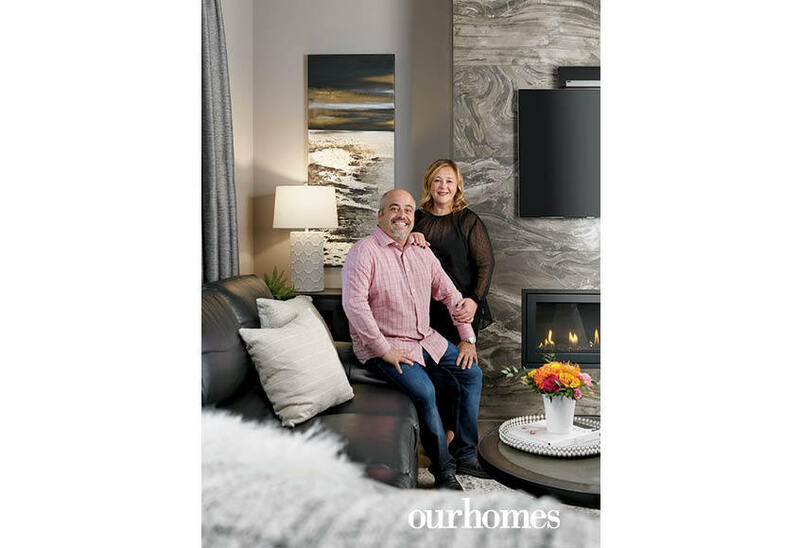 When it came to choosing colours, Tina and Frank – whose previous home was done in warm earth tones and browns – gravitated toward cooler, grey tones for a change of pace. 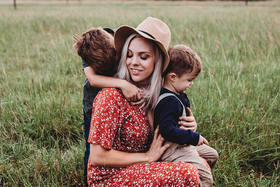 “Since this is their forever home and they’re not going to change things like the floor or fireplace, we helped them choose finishes that will be flexible down the road, so they can adapt as the trends or their tastes change,” explains Jill. The flooring, for example, is engineered wide-plank hickory with mid-tone shades of both greys and browns. 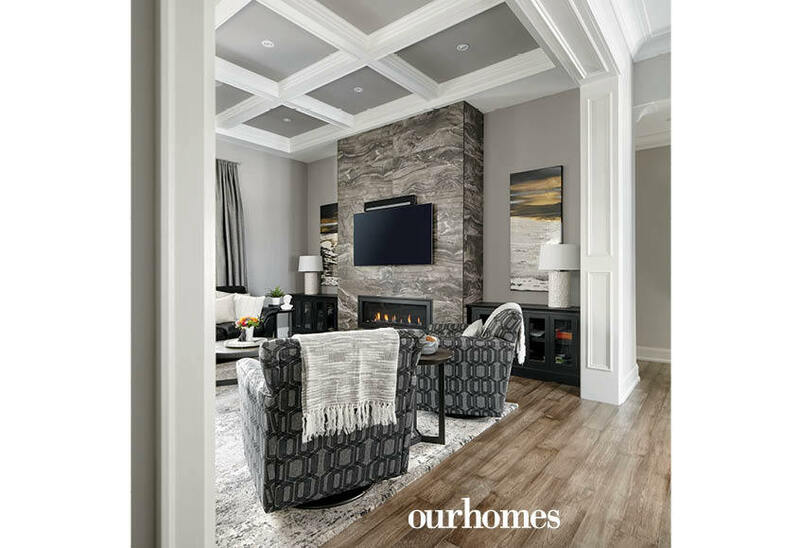 In the family room, the sleek, modern gas fireplace is a focal point, with an Italian tile that incorporates both cool and warm tones. Kitchen cabinetry by CR Technical Woodworking and appliances were sourced at Peter Martin Appliances. 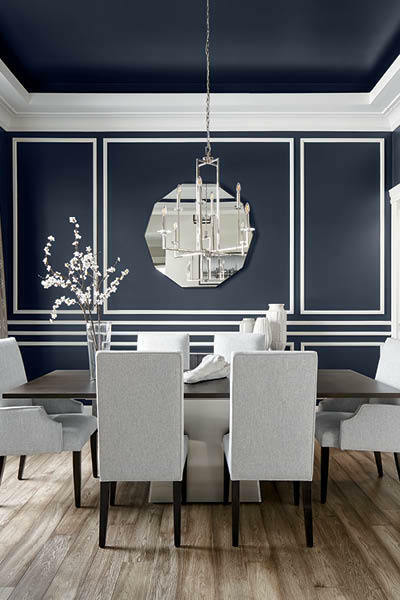 In the dining room, the striking black-and-white colour scheme was a design departure for the couple. 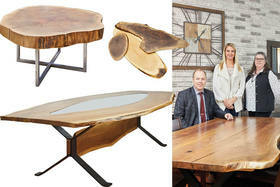 “I was so excited when Tina said she wanted this look in her dining room,” says Jill. 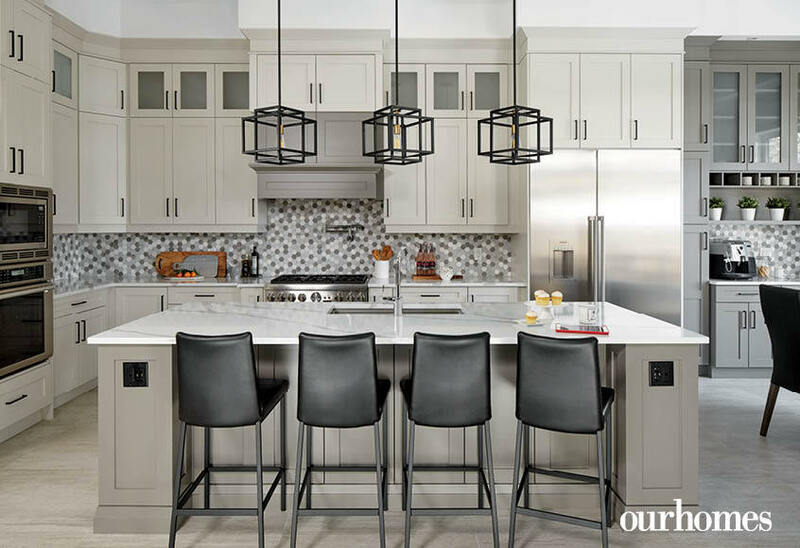 “It’s such a bold choice for the first room people see when they walk into your home.” Chandelier and lighting throughout the home from Elm Ridge Lighting. The entryway is enhanced by porcelain tile laid in a herringbone pattern and a stately 14-foot ceiling. 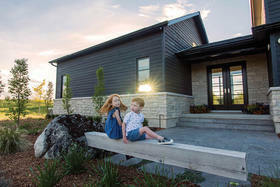 Owners and builders Frank and Tina Carestia of Duca Homes happily collaborated on the many decisions a new build requires. 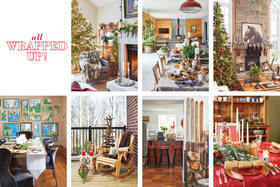 Designers Jill Fraser (House of Fraser Decor) and Christina Wickenden (The Green Door Decor). The owners wanted the cabinets to be the focal point of the kitchen, so they opted for simple and elegant flooring. 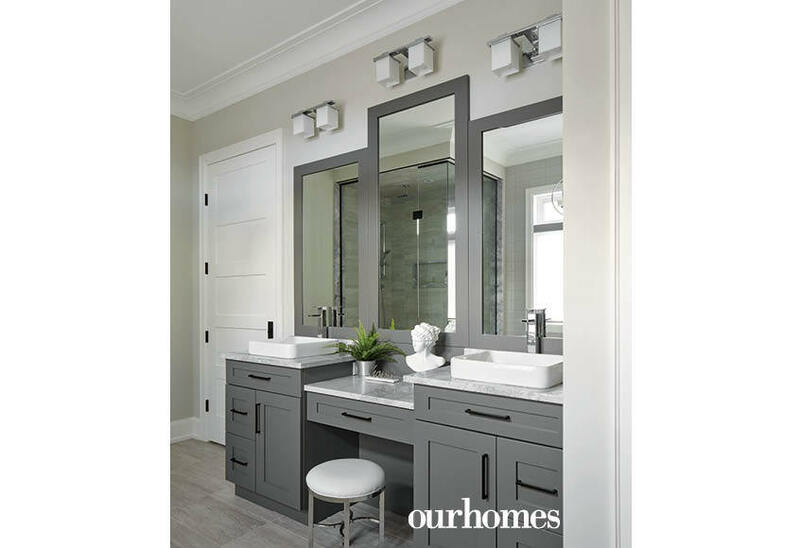 Light fixtures throughout the home are low maintenance. A large island for the home chef is wonderful for both baking and entertaining. 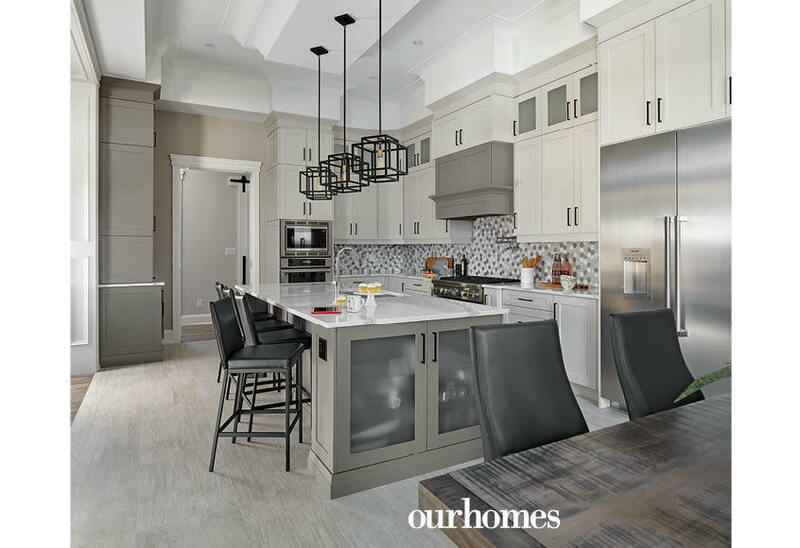 The body of the kitchen cabinets are pale oak, and the accents darker grey. 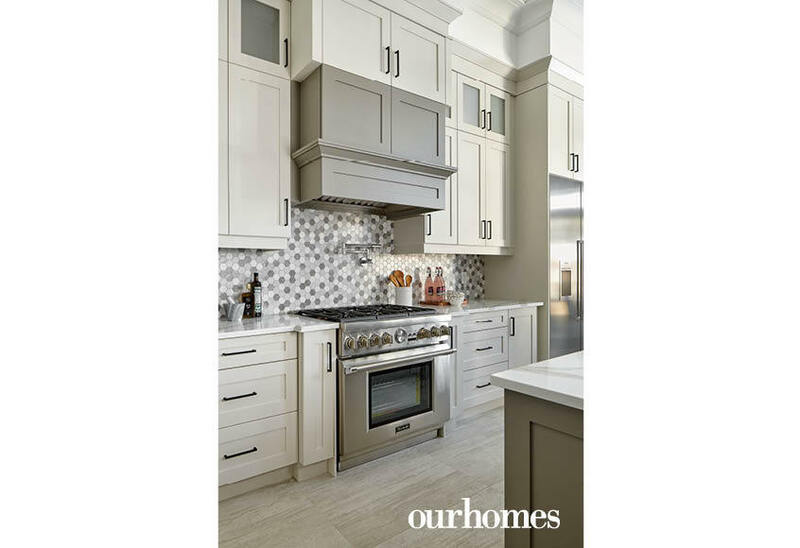 A hexagon-tile backsplash gives it texture. 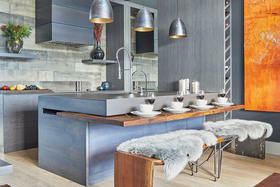 The spacious kitchen includes a coffee bar and room for a substantial casual-meals table. 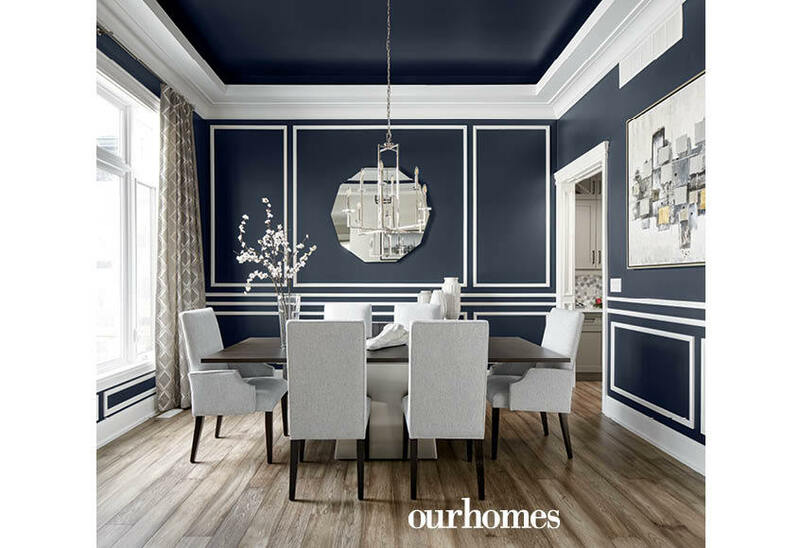 The owner originally saw this bold colour scheme in a magazine spread used in a living room, envisioning it for her dining room. 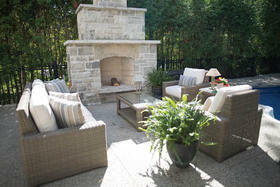 Custom curtains complement the sizeable windows in the kitchen, family room and dining room. 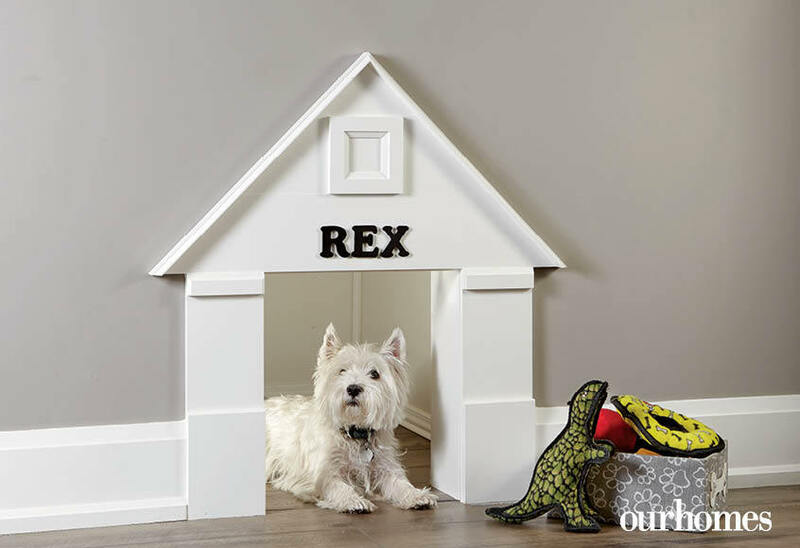 When you build your own home, you can design a dog door anywhere you like! Rex, the family terrier, has his own room off the kitchen. 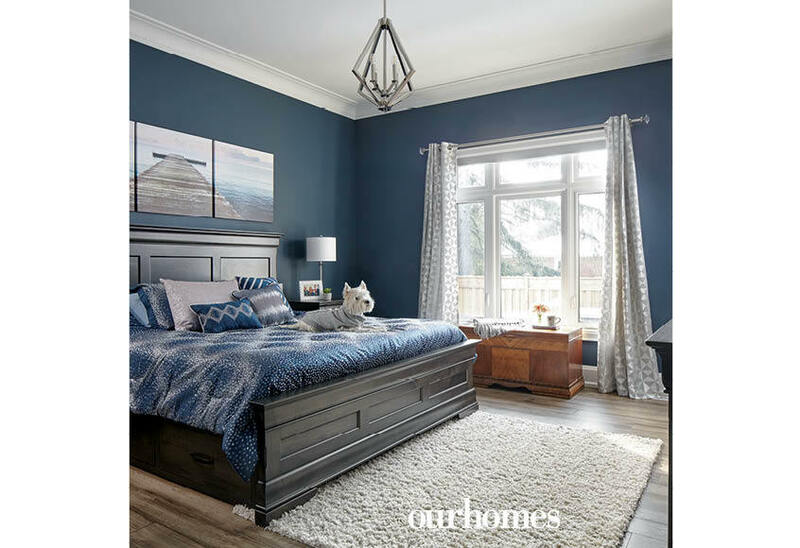 The master bedroom is done in Sherwin-Williams’ Sea Serpent – not a blue blue, and not a black. The family pup wear's a coordinating blue sweater. 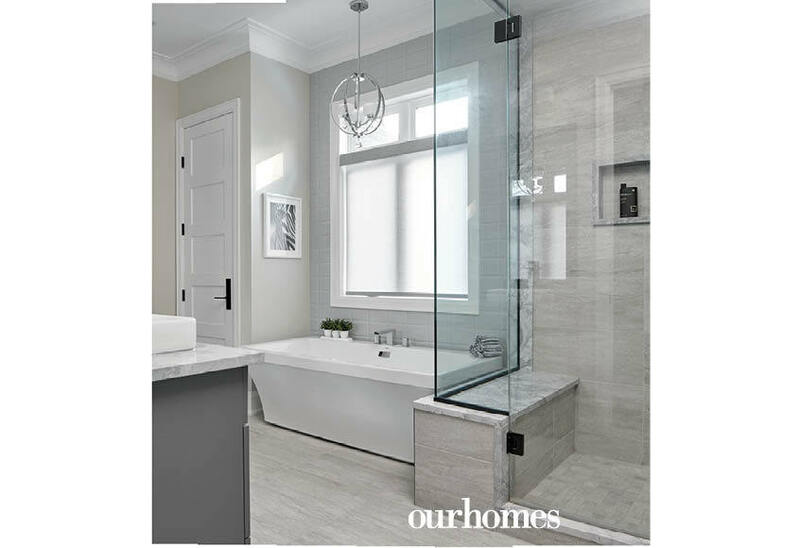 The master en suite opens off the hallway, allowing the couple to keep different hours without disturbing each other. 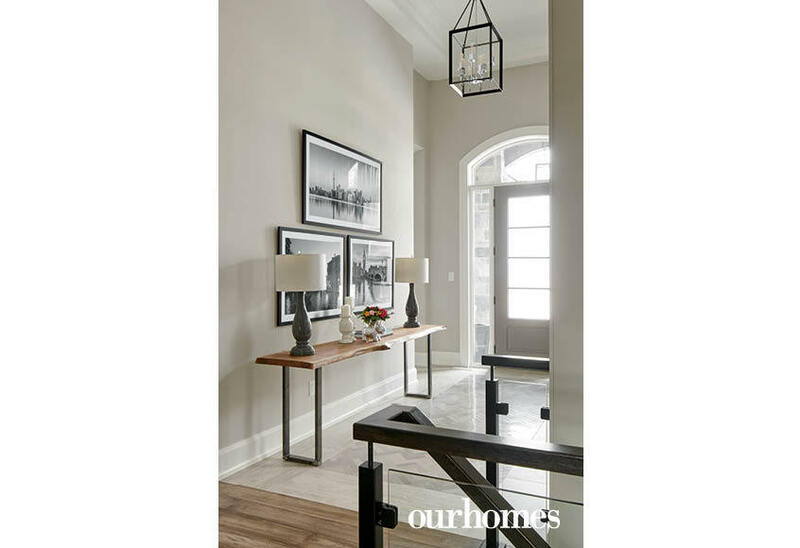 Dark hardware is an attractive accent against various shades of grey. A tiled shower and vessel tub make for a useful master en suite. The open plan lower level was designed so that there are no posts. 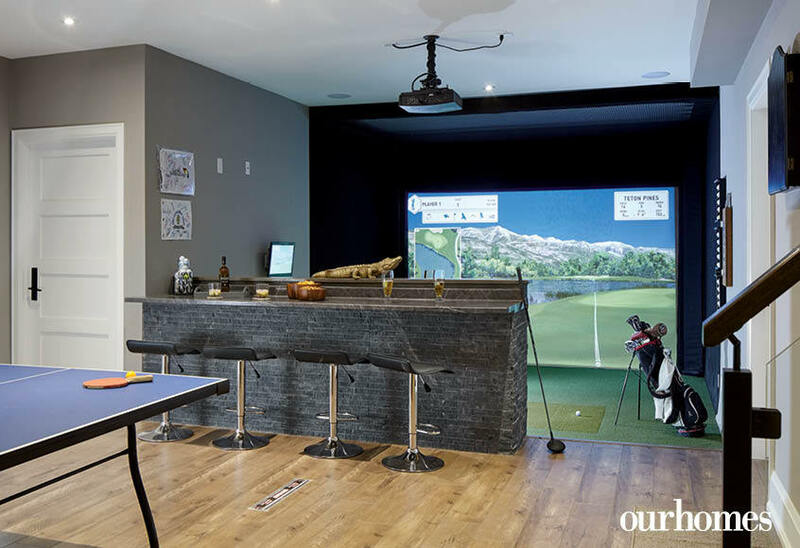 But there is a kitchen, bathroom, rec room, and – most fun – a golf simulator.